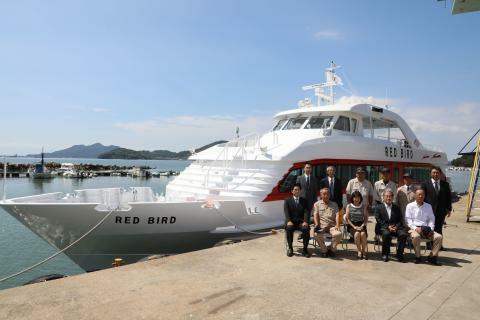 TSUNEISHI FACILITIES & CRAFT CO., LTD. (HQ: 1471-8 Urasaki-cho, Onomichi, Hiroshima; President: Jun Kambara) completed the construction of the 61 GT aluminum alloy passenger ship RED BIRD and delivered it to Shikoku Kisen Co., Ltd. on August 30, 2018. The newly completed RED BIRD will service the regular ferry routes connecting Naoshima to Uno Port (in Tamano City, Okayama Prefecture) and Takamatsu Port (in Takamatsu City, Kagawa Prefecture). 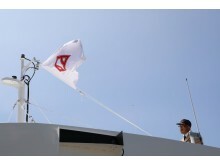 Because Naoshima is very popular as an island of art, it is very important for local residents and tourists at home and abroad, who come to visit it, to have RED BIRD as sea transportation. TSUNEISHI FACILITIES & CRAFT will continue to enhance various factors in shipbuilding including safety, seaworthiness, and propulsion performance, with the goal of developing highly convenient ships that answer the needs of our customers. Shipbuilder: TSUNEISHI FACILITIES & CRAFT CO., LTD.
■ TSUNEISHI FACILITIES & CRAFT CO., LTD.
TSUNEISHI FACILITIES & CRAFT CO., LTD. is engaged in the building and repair of aluminum alloy vessels, general construction, and lifeboat maintenance and inspection. In our pursuit of safety and comfort for marine traffic and lifestyles through these businesses, we challenge ourselves to take on new initiatives that will enable people to live pleasantly, in a manner that gives them a sense of reassurance toward the future. 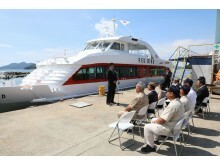 Types of vessels built: Passenger ships, fishery patrol boats, etc.